Tim Bene, Dorcas Robinson, Fatima Laanouni, Karen Bahr Caballero, Ben Murphy and Dave Wilson. Itad’s strategic evaluation provides a formative and forward-looking assessment of WFP’s support for enhanced resilience. Its purpose is predominantly to promote learning to inform resilience programming across WFP. 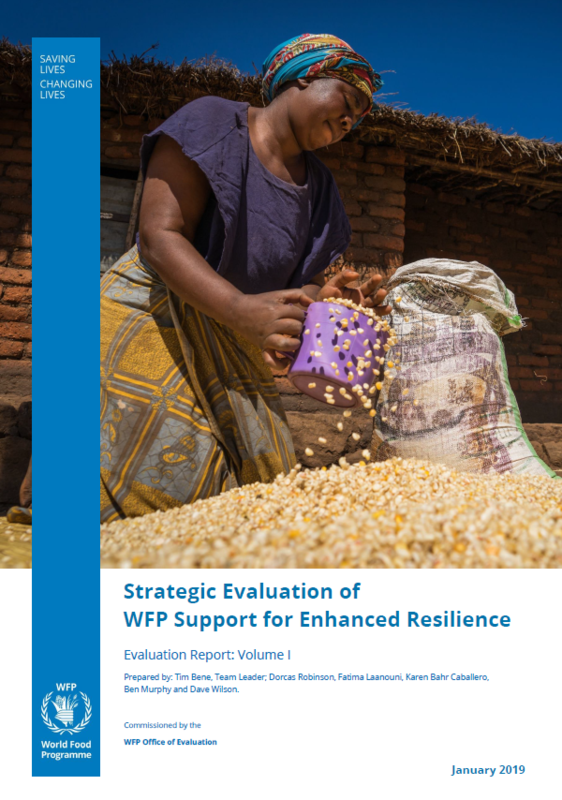 The evaluation team used a “theory of delivery” model to examine how and to what extent WFP’s concepts, strategies, guidance, systems, programmes, people, partners and information work together to strengthen its support for enhanced resilience. The evaluation team concluded that WFP has the foundations for and high-level strategic commitment to supporting the enhancement of resilience in order to improve capacities to deal with shocks and reduce the need for repeated humanitarian interventions. These need to be grounded in the operational realities and matched by demands for better guidance, measurement and systems if WFP is to make a significant contribution in this area. Establish an interdivisional leadership team tasked with developing a strategy for enhancing resilience in order to achieve zero hunger and chaired by the Assistance Executive Director of the Operations Services Department. Integrate issues related to gender equality, empowerment and resilience into guidance on the zero hunger strategic review process and the IRM for country offices. Strengthen the financial and partnership base for initiatives on resilience enhancement. Building on the strategy developed (recommendation 1), commission a workforce study that assesses the horizontal and vertical adjustments needed in order to ensure that WFP employees can successfully deliver on resilience-focused commitments. Consolidate performance measurement data from resilience-related initiatives for corporate reporting and sharing with national partners. Strengthen the ability of headquarters units and regional bureaux to collect, collate and analyse information on covariate transboundary and localized shocks before they happen. Support the generation of evidence on the relevance of food security and resilience interventions in conflict and protracted crises. Find the Summary Evaluation Report, Annexes, Management response and more on the WFP website.